Stand mount horizontally or vertically, or combine to create your perfect mixing, mastering or recording environment. 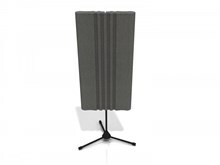 Equally ideal for location recording or spaces where variable acoustics are required. FreeSpace is lightweight and can be fitted to any standard mic stand in seconds thanks to the elegant fixing method. No need to cover your walls with messy glue, FreeSpace optimises your acoustics with the minimum of hassle! Formed from a rigid, open cell acoustic foam, FreeSpace can be used to absorb sound reflections and create separation between instruments and microphones. Efficient across a broad range of frequencies with pronounced performance in the ‘mids’, FreeSpace is engineered to avoid over absorbing high frequencies which can lead to lifeless and inaccurate sounding rooms. A contemporary design featuring clean lines and manufactured to our usual high standards, FreeSpace looks the part in any recording studio or listening space. Combine multiple units for unlimited acoustic possibilities!